Six years ago, Linsdey Conon was searching for a more efficient way to work out. Separate “lifting” and “cardio” days didn’t fit in her busy schedule, so she was happy to discover CrossFit. 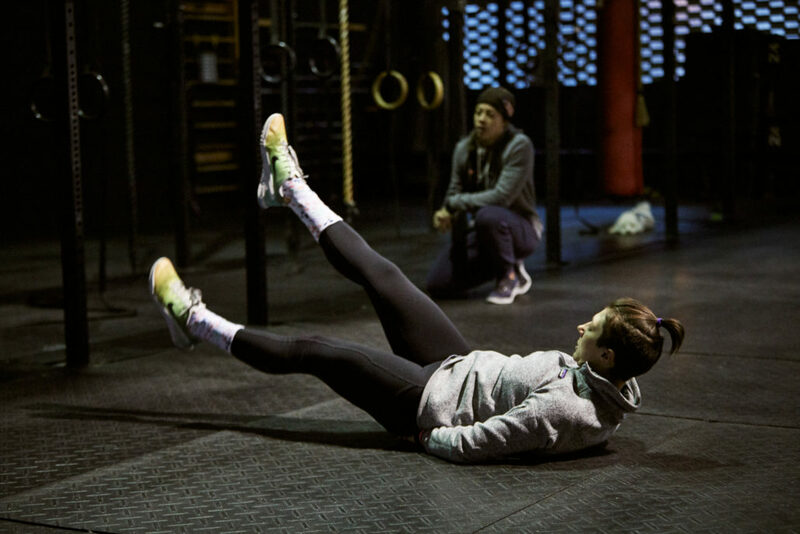 Considering she’s managed to work out five times a week while completing an MBA, juggling a full-time job, becoming a mom, and volunteering, CrossFit seems to be a pretty good fit! However, all the credit goes to Lindsey. She works hard and is incredibly disciplined (you have to be to get to the 6 a.m. class every day). Six years in, she continues to set PRs and work towards new goals—strict pull-ups and handstand push-ups are definitely in the not-so-distant future! Read our Q&A with Lindsey and get to know April’s Athlete of the Month! I am not sure how I discovered it! Prior to CrossFitting, I tried my hand at being a spinning instructor, power lifter, runner and competitive cyclist along with a regular yoga practice. I was entering business school in the fall of 2013 along with working full-time, and I was looking for a more efficient way of working out that didn’t involve “cardio” and “lifting” days. My boyfriend at the time, now husband, most likely mentioned CrossFit to me and hence, here we are six years later. Why did you end up sticking with CrossFit? That’s a good question. I really liked the people I met and the variety of movements we were learning and perfecting. I appreciated the coaching immensely, as not getting injured is important to me. I initially started coming three days a week with a mix of running and cycling on the other days. I now have been coming to CrossFit about five days a week since March of 2017 (coinciding with my 20th week of pregnancy and no longer being able to cycle). I tore my meniscus in December of 2016, so running was no longer viable, and hence, I’ve been a full CrossFit convert since then. Tammy has a knack for modifying workouts for pregnant people and injured people so they still feel challenged. With the warmer weather coming and hopefully a full recovery from knee surgery in January, I am looking forward to cross-training with running and cycling once again. I have always been an extremely disciplined person. However, I was always work and no play. Since joining CrossFit, I continued to work full-time, got married, finished an MBA, became a mom and have found time to do volunteer work. I guess you’d say my life is fuller since joining CrossFit 718. I have always been an early morning person and have worked out between 6am and 8am since college. Since having our son, my husband enables my CrossFit. He gets our son ready for daycare and I go to CrossFit at 6 a.m. I finally got more than one kipping pull-up during 19.4, although I am not officially registered for the open! Tammy even posted it to Instagram! Since joining CrossFit it was always a goal and as a mom, I really want to be able to “race” my son across the monkey bars on the playground. Next up: a handstand push-up and a strict pull-up. I spend a lot of time with my husband and son at the JJ Byrne Playground in Park Slope. I design health benefit programs for employers to offer their employees, and I lead our initiatives around maternity and fertility benefits. I volunteer as a court-appointed special care advocate (CASA) to kids in foster care. And I try to get to yoga a few days a week.